Email might just be the biggest direct marketing tool in your arsenal. It can also be the easiest. Studies show that readers who join your email list are 10x more likely to become paid subscribers. And getting people to join your email list doesn’t have to be difficult. In fact, most of it can be automated. Take a look at what Track & Field News has done. It starts with a simple pop-up created through Mailchimp. 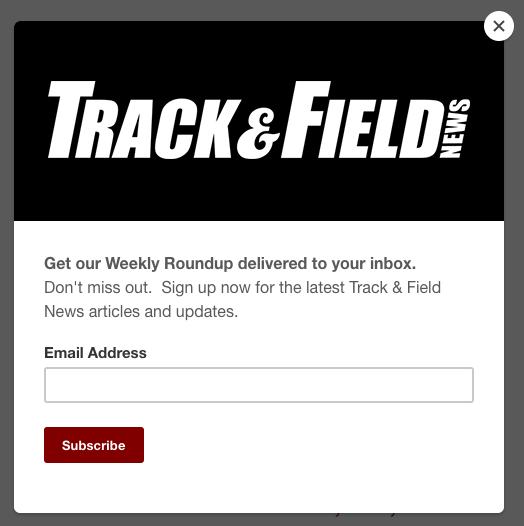 This pop-up shows up on Track & Field News’ most popular pages and simply requests that people sign up. Once you’ve started gathering your list, make sure to send them good content. It’s not enough to send one-time log-in instructions or promotional materials. You want your emails to remind them that you have a lot of value to offer. Fortunately, you can automate that, too. Just set Mailchimp to compile new articles or issues into a periodic email blast. From there, you can just sit back and watch your pop-up collect emails and your content convert subscribers. 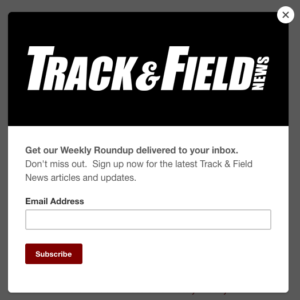 Since Track & Field News switched to MailChimp and launched that pop-up in April 2018, it has been the single largest source of new email members. They’ve also seen their list triple in that time. That’s a nearly 300% growth rate. It really can be just that easy. Want to learn more about how quick and easy email marketing can expand your reach? Let’s chat.